How much does it cost to travel to Andorra? How much money will you need in Andorra? €132 ($148) is the average daily price for traveling in Andorra. The average price of food for one day is €36 ($40). The average price of a hotel for a couple is €110 ($124). Additional pricing is in the table below. These average travel prices have been collected from other travelers to help you plan your own travel budget. Andorra is a small, mountain covered, country in the Pyrenees Mountains nestled between France and Spain. This lesser-known country is very much a hidden gem thanks to their stunning scenery, amazing ski resorts, and ancient cathedrals. The official language is Catalan, although Spanish, French, and English are widely spoken. Andorra experiences quite cold and snowy winters, which run November through March, although this makes for perfect ski conditions! Throughout summer, from June through August, temperatures warm up to the low 70's Fahrenheit, making for great trekking weather. 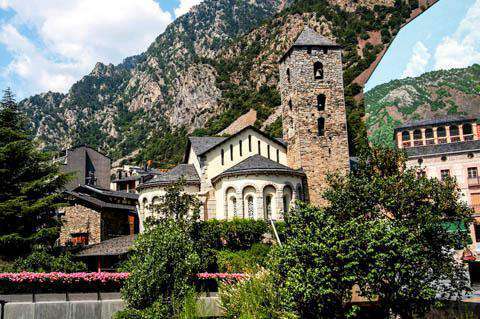 Andorra is covered in ancient churches and lovely old villages which are only made better by the stunning natural scenery surrounding them. One such ancient church can be found in La Vella, called the Church of San Esteve. This church dates back to the 12th Century and is open for touring July-August. In Encamp, you'll find the Complex at les Bon, a stunning medieval complex consisting of the Church of Sant Roma, a defense tower, and an ancient water tank and irrigation channel cut from the rock. In Canillo, you'll find the Sant Joan de Caselles, an incredible church dating back to the 11th and 12th Centuries which offers free guided tours. Be sure to check before you go though, as the church is only open July-August. Canillo is also home to the Meritxell Sanctuary, which is dedicated to the patron saint of Andorra, the Virgin of Meritxell. Spend the day visiting the Sanctuary then getting lost wandering through Canillo's old town full of gorgeous architecture. Although Andorra is a very small country, they do have quite a few villages, some of which are dedicated homes to the country's ski resorts. Andorra la Vella: Also called La Vella, the country's capital and home to many churches and buildings dating back to the 12th through 16th Centuries. Sant Julia de Loria: On the border of Spain and most famous for being home to the Museu del Tabac. Escaldes-Engordany: A lovely place to walk about and enjoy the natural scenery along with the famous Roc del Metge hot spa. Encamp: Near the French border and the village of the medieval Complex at le Bons. La Massana: A popular area for skiing and exploring ancient architecture in the Pal Village. Ordino: One of the least inhabited, but largest, villages in the country where you'll find ski resorts, churches, and ancient squares. Canillo: Near the boarder of France, boasting stunning ancient architecture and churches. Arinsal: A small village full of ski resorts and the starting point of treks to the tallest mountain in the country, the Coma Pedrosa. Andorra is best known for their many ski resorts, with two primary Alpine skiing areas: Vallnord and Grandvalira. Vallnord has three different ski areas, all accessible by cable car, while Grandvalira has six different skiing areas. You needn't worry which resort you stay in though, as you can purchase a ski pass allowing you access to all ski areas in Andorra. During the summer, Andorra is a popular hiking destination thanks to the Coma Pedrosa Mountain. When hiking the Coma Pedrosa, you'll find incredible lakes, the valley of Tor, and many mountain huts. The Pic de Medecourbe Mountain offers a less strenuous hike while still getting amazing views of lakes, forests, and the Valley of Arinsal. Andorra's favorite ingredient is lamb, which can be found in dozens of various dishes. The country also offers a great infusion of French and Spanish cuisine, with plenty of cheese and wine involved. You'll be able to find great food options in all of the villages, with La Vella offering the widest range of options. For some authentic cuisine, head to Plato restaurant in La Vella where you'll find local food in a fantastic setting right downtown. There are just two entrances in and out of Andorra, with one in France and the other in Spain. There are no airports or train stations inside of the country, although you can easily fly into Perpignan Airport, France or Lleida Airport, Spain then take a bus into the country. You may also rent a car from either France or Spain which you can easily drive into, and around, Andorra. To get around, there are eight bus lines running throughout the country which stop at the majority of villages. When in each village, you can easily get around on foot.